Had enough of predictable racing games? Of listlessly nudging hatchbacks around grey ovals? Of attaching stickers to the sides of Japanese sports cars? Us too, which is why we have the hots for MotorStorm. In every race you're running a chaotic gauntlet of erratic physics, hostile AI and dangerous muddy slop. And it demands intense concentration because no two races are ever the same; by the third lap the course will have been carved and smeared into a brown sludge, mutilated objects and pulverised car shells blocking every turn. It's a game that uses its complex physics engine as a core element, rather than a gimmick that'll add an extra bullet point to the press release. 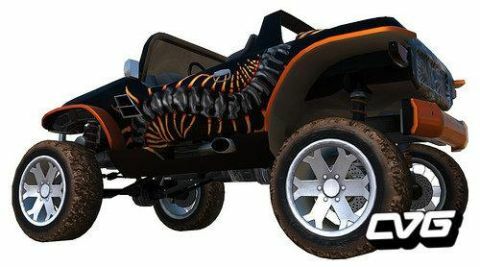 There are six vehicle classes to choose from: bikes, buggies, mud pluggers, big rigs, rally cars and ATVs. And because they're all so different we're going to go through them one by one. So, bikes - they're our favourite. At the expense of being easily knocked off you can weave through small spaces and packs of other cars. Furthermore, if an ATV or fellow bike rider is nearby, you can press square to punch them and knock them flying into the muck. Next, buggies. They have all the haste of a bike but benefit from being much more robust. You can really jerk them around and, if you're skilled, can barrel across rocky areas without flipping out and crashing. Their biggest drawback is that it doesn't take much for them to explode. Description Don't think mud is dangerous? You haven't seen the way these off-road rides throw it around in this full-contact racer.